Belle is a beautiful new line of florals from Quilting Treasures. Sew Speedy is an adorable new paper pieced mini quilt from Whole Circle Studio and features the cool new Ombre Stitches fabric line from Quilting Treasures. Quilt Patch is making Alphabet Soup! This cute and cuddly little quilt kit will be available soon - stop by the shop or call 704-821-7554 to reserve your kit! September 23-26, 2018 - Only 3 Spots Left! Our project is Little Charmer, a 5" square friendly quilt. This one is small, sweet and simple! Don't need another project? No problem - just work on whatever you'd like. All retreat supplies are 15% off at Quilt Patch Fabrics! For more information contact deborahquilts@hotmail.com. Go to quiltpatchfabrics.com/classes.htm for more details on all of our classes. To register call us at 704-821-7554. 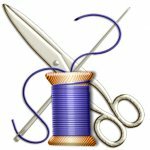 Keep your sewing machine in tip top shape for classes and retreats - our friendly next door neighbor, AAA Sewing Shoppe, is offering a Spring Cleaning Special for your overworked, winter weary sewing machines. This special offer includes cleaning, oiling, and tension adjustment for only $49.99! Perfect for those little machines that don't need a major repair but could still use a little TLC. Any potential problems will be diagnosed and further repairs suggested if necessary. Offer good through May 31, and cannot be combined with any other offer/coupon. Keep your sewing machine in top shape for classes and retreats! 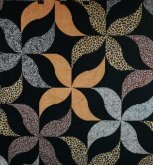 Contempo Quilts - NEW DATE ADDED! Since our May 5 class filled up so quickly we have added another class date for this gorgeous modern quit! Learn to sew gentle curves with ease. A simple design creates movement in this lively contemporary quilt. The twirling ribbons practically burst from the surface! The teacher made hers with animal prints with a black background that really made them pop! Uses the Quick Curve Ruler and the book, One Wonderful Curve. This ruler is also used in the Abacus class below. 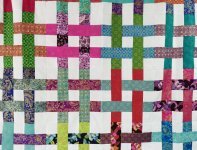 This jellyroll friendly quilt pattern gives you a woven look that's fun and funky. Use the Quick Curve Ruler to make this lovely string of beads pattern recalling the mathematician's abacus. Quilt your own pretty ladies all in a row. Use a layer cake for a coordinated variety!